The Subscriber having, at much expense, fitted up a handsome vessel to ply upon the River Clyde, between Glasgow and Greenock, to sail by the power of wind, air and steam, he intends that the vessel shall leave the Broomielaw on Tuesdays, Thursdays, and Saturdays, about mid-day, or at such hour thereafter as may answer from the state of the tide — and to leave Greenock on Mondays, Wednesdays, and Fridays, in the morning, to suit the tide. 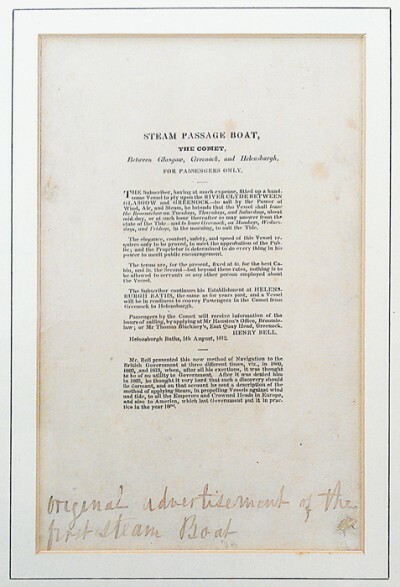 The elegance, comfort, safety, and speed of this vessel require only to be proved, to meet the approbation of the public; and the proprietor is determined to do everything in his power to merit public encouragement. The terms are for the present fixed at 4s. for the best cabin, and 3s. the second; but beyond these rates nothing is to be allowed to servants or any other person employed about the vessel. The subscriber continues his establishment at Helensburgh Baths, the same as for years past, and a vessel will be in readiness to convey passengers in the Comet from Greenock to Helensburgh. Passengers by the Comet will receive information of the hours of sailing by applying at Mr. Houston's Office, Broomielaw; or Mr. Thomas Blackney's, East Quay Head, Greenock.